One New Aftermarket Replacement 36 Double Walled Chrome Exhaust Stack (with Bend) made to fit John Deere Diesel Tractor models: 3010 (S/N 6644 & Up), 3020 (Up to S/N 122999), 4010 (S/N 7027 & Up), 4020 (Up to S/N 200999), All for Diesel models only. To fit Tractors above the Serial Numbers listed, the Hood Exhaust Hole must be Enlarged. At Inlet Base Chrome Double Walled / Lined 16 Gauge. Please Note: Does Not fit Tractors equipped with Oval Mufflers. Our processing system is automated. 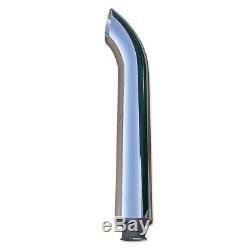 The item "36 Chrome Exhaust Stack with Bend Made to fit John Deere 3010 3020 4010 4020" is in sale since Wednesday, June 22, 2011. This item is in the category "Business & Industrial\Heavy Equipment Parts & Accs\Tractor Parts". The seller is "reliableaftermarketpartsinc" and is located in Williamston, Michigan. This item can be shipped worldwide. 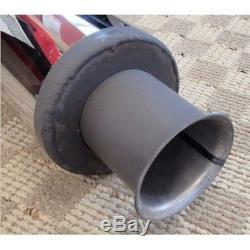 Type: Muffler & Exhaust Parts, Mufflers, Exh.